Thought when after some crossfire between Peyton Manning and Colts owner Jim Irsay and they released a joint statement saying there's no hard feelings that maybe Manning would return to Indianapolis? Well think again because Jason La Canfora reported that not only will Manning not return to the Indianapolis organization, they made the decision weeks ago. So now the story will be both sides moving on from here. This is not a surprise that the Colts are moving on. Everybody knows that the Colts are going to select Andrew Luck, it'd be a grave mistake not to. Besides Manning is coming off three neck surgeries in the last year and a half and is 35 so there is a legitimate injury risk and his best years are in all likelihood behind him. And having both Manning and Luck on the roster would be very expensive and cause cap problems. So the Colts are making the right move and there will be a market for him via trade. Teams that need a quarterback will jump at the chance to acquire him and teams looking to make a Super Bowl run will give the Colts a top draft pick. I think the top contender right now are the Redskins. Granted I've also made the argument that Manning should retire. We've seen throughout NFL history quarterbacks who change teams and hang on for too long. Remember Johnny Unitas with the San Diego Chargers? Joe Namath with the Los Angeles Rams? The only thing for the Colts now is to build a team around Luck. The new coaching staff, led by recent hire Chuck Pagano, is likely to start Luck right away, like what the Falcons did with Matt Ryan, the Rams did with Sam Bradford, and the Panthers did with Cam Newton to positive results. But it would be beneficial for Luck to have a veteran backup that can help him adjust to the league. That could mean bringing back Kerry Collins for another season if he doesn't retire (although he is useless in gameplay) or maybe bringing in a Shaun Hill type, who is one of the better backups in the NFL. 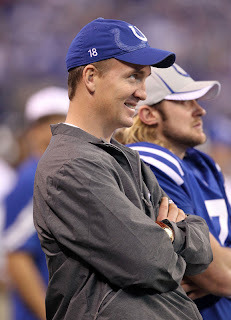 And quite frankly, I don't think that Manning would want to return to Indianapolis. This is a team that is rebuilding and building for the future, not trying to load up for a Super Bowl run. Considering that, why would he want to return to a rebuilding club as he begins to enter the twilight of his career?